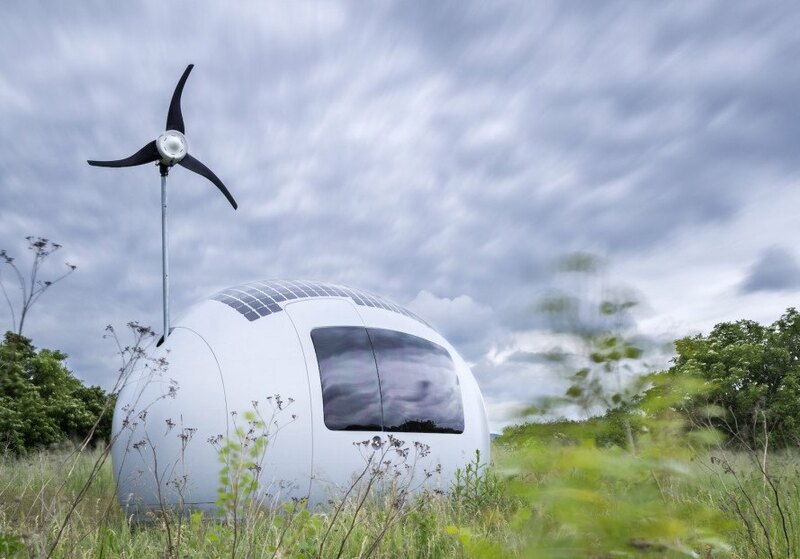 The solar-powered and wind-powered EcoCapsule of your dreams is finally available for pre-order. Developed by Nice Architects, the self-sustaining mobile home promises a “new way of sustainable living” that lets you live with greater freedom in almost anywhere in the world. If you'd like an EcoCapsule of your own, act now - the first run consists of just 50 pods, and they're going fast. With just 8.2 square meters of floor space, the compact EcoCapsule may seem small on the outside, but the interior looks surprisingly spacious and comfortable. Clad in an insulated fiberglass and aluminum shell, the off-grid pod houses up to two people and includes a bathroom with a shower and composting, waterless toilet; a small kitchen area with a sink and two-burner stove; sofa that folds out into a double bed; ample storage; low-flow fixtures; desk space; LEDs; and electric hookups. All the furniture is made from lightweight honeycomb panels with a wood veneer finish. The EcoCapsule produces all of its energy onsite with high-efficiency 600W rooftop solar panels and a 750W low-noise wind turbine installed on a telescopic pole. The electricity feeds into a minimum 10kWh battery and powers everything in the structure, from the floor heating to the water heater. The smart home system and sensors can be controlled remotely from a smartphone app. All rainwater collected is filtered with reverse osmosis. The two 350-liter water storage tanks can also be topped off from other sources such as lakes or rivers. 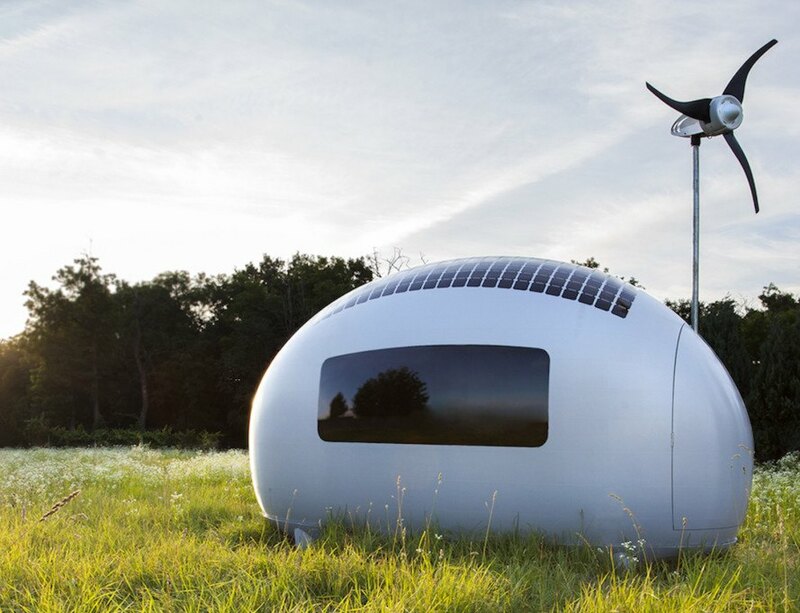 Set on four small wheels for easy transport, the EcoCapsule also includes two hooks on the roof that make it possible for the structure to be moved or dropped in place by crane or helicopter. A customized trailer will be available for order in 2016 to allow users to tow the mobile home by car. When living off-grid, the fully charged 10kWh battery will provide electricity for at least four days at an average 2.2 kW per day rate of consumption; higher-capacity battery packs can be swapped out with the base unit. Second what Christian said. Let's not be pretentious, this is a wee overpriced caravan with all the fittings. Mounting a wind turbine so close to the roof is bad enough, but photographing it in amongst trees many times taller than it made me cringe. That turbine won't generate anywhere near 750W around even young trees unless a storm starts blowing. Crazy Expensive... better to build and design your own!! With just 8.2 square meters of floor space, the compact EcoCapsule may seem small on the outside, but the interior looks surprisingly spacious and comfortable. 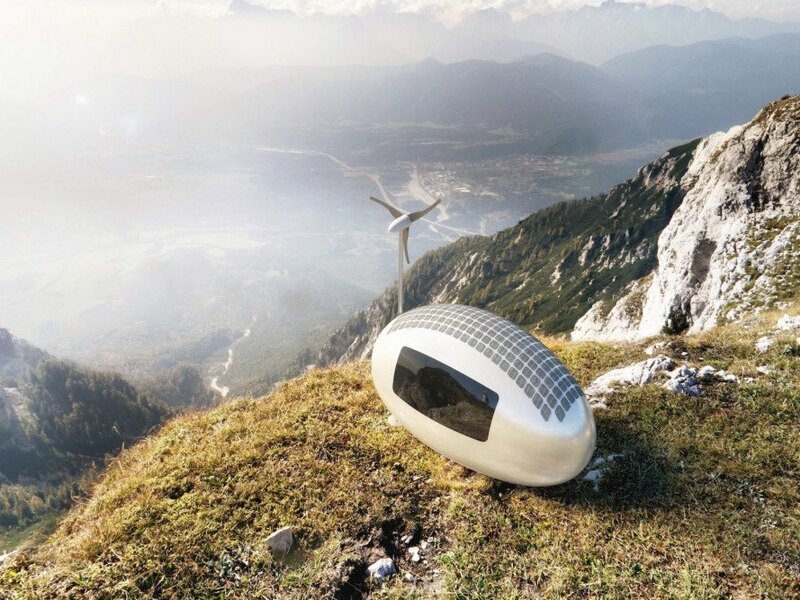 Clad in an insulated fiberglass and aluminum shell, the off-grid pod houses up to two. The interior includes a bathroom with a shower and composting, waterless toilet; a small kitchen area with a sink and two-burner stove; sofa that folds out into a double bed; ample storage; low-flow fixtures; desk space; LEDs; and all the electric hookups you’ll need. All the furniture is made from lightweight honeycomb panels with a wood veneer finish. The structure runs on a 10kWh battery. The EcoCapsule produces all of its energy onsite with high-efficiency 600W rooftop solar panels. The 750W low-noise wind turbine is installed on a telescopic pole. The electricity feeds into a minimum 10kWh battery and powers everything in the structure, from the floor heating to the water heater. The smart home system and sensors can be controlled remotely from a smartphone app. All rainwater collected is filtered with reverse osmosis. The two 350-liter water storage tanks can also be topped off from other sources such as lakes or rivers. 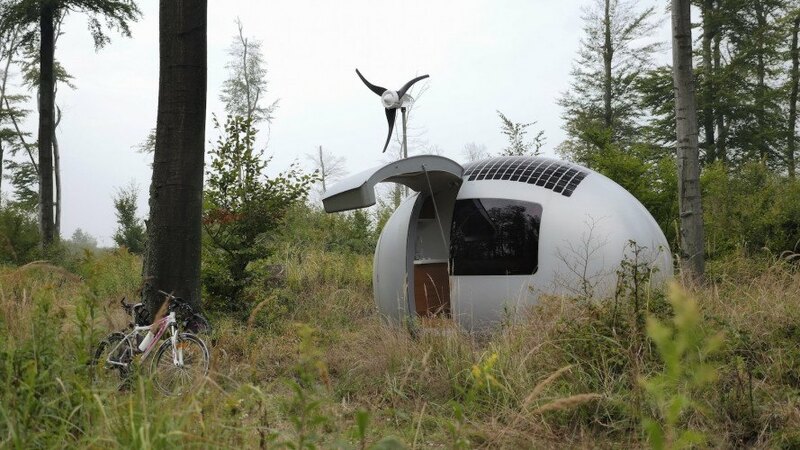 Set on four small wheels for easy transport, the EcoCapsule also includes two hooks on the roof that make it possible for the structure to be moved or dropped in place by crane or helicopter. A customized trailer will be available for order in 2016 to allow users to tow the mobile home by car. When living off-grid, the fully charged 10kWh battery will provide electricity for at least four days at an average 2.2 kW per day rate of consumption; higher-capacity battery packs can be swapped out with the base unit. The interior is accessed through a gull-wing door. The first 50 EcoCapsules available for pre-order are part of a limited edition run. The early-bird structures are customizable and priced at €79,000 each excluding shipping. Pre-orders are limited to the European Union and associated countries, the U.S., Canada, Australia, and New Zealand. The second generation EcoCapsule will be available in 2017 for a lower price and will be shipped worldwide with no limitation. The EcoCapsule could be located on a beach. Plan of the EcoCapsule interior. EcoCapsule can be hooked up to your car. Diagram of clean energy sources.